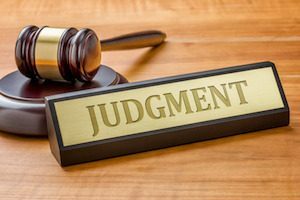 Personal injury judgments come into play after a trial finishes and a judge or jury finds the defendant liable for the plaintiff’s injuries. In theory, the defendant should quickly write a check to satisfy the judgment and provide the plaintiff with the compensation the legal system declared the plaintiff may collect. But the reality is much more complicated. Even if the defendant has lost at trial, it still has ways to fight back against the plaintiff. Sometimes there may be legal issues gone awry. A defendant can file to either have another trial or modify the verdict entered against it. These post-trial motions usually aren’t successful, as they largely rely on a judge having to admit he or she made a mistake during the trial. But occasionally, the judge will grant the motion. This is a significant threat that the defendant can wield to reduce the amount it may owe. After a defendant loses a trial, it can file an appeal. It may take years to complete this appeal. Once this appeal ends, and assuming the plaintiff wins this first appeal, there is often an opportunity for the defendant to file yet another appeal, which can take another few years to complete. So even if the defendant loses both appeals, it can add several years to the time it will take for the plaintiff to get paid. The defendant knows this and will often threaten or begin an appeal to negotiate a settlement amount that is lower than the judgment amount. Most of the time, this isn’t an issue because almost no plaintiff will begin a lawsuit against a defendant who cannot pay. In practice, this means the plaintiff’s attorney will make sure the defendant has insurance that can pay any judgment the plaintiff might obtain against the defendant. But even if there is insurance, it may be too little to cover the judgment amount or the insurance company will find a way to avoid paying. And in situations where the defendant is wealthy, the plaintiff may still be unable to collect if the defendant declares bankruptcy or the defendant’s finances suddenly change before the plaintiff can receive payment. When this occurs, the plaintiff is often unable to collect the judgment he or she should receive. However, the plaintiff is not completely out of luck. The plaintiff is often allowed to garnish the defendant’s wages. But this isn’t a perfect solution for several reasons. First, the garnished amount is usually very small compared to the judgment and as such, will take a very long time to collect. Second, the defendant can always decide to stop working or declare bankruptcy. If either of these occurs, the plaintiff may get nothing. Third, there are limits and restrictions on the ability to garnish wages. For instance, you can’t garnish someone’s pension or Social Security payments. If you’re thinking about personal injury judgments and whether you may be able to obtain one, think about contacting our experienced legal team at Williams & Williams, LLC, online to discuss your legal options.